The Arcadia was a large transport ship used in 2018 to transport Isla Nublar dinosaurs to the Lockwood Manor five miles outside Orick, CA. Originally, Benjamin Lockwood had been sold under false pretenses the idea of a sanctuary island by Eli Mills and that the Arcadia would be transporting dinosaurs rescued from the wrath of Mt. Sibo to this sanctuary island, however Mills had secretly plotted with disgraced InGen geneticist Dr. Henry Wu to steal the dinosaurs and sell them at auction in order to fund Wu’s Indoraptor project, the successor to the Indominus project. 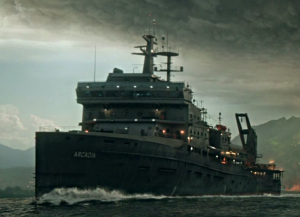 The ship itself is reminiscent of landing platform dock ships, or LPDs, that are used by military fleets around the world for amphibious assaults. The stern loading bay is especially reminiscent of the shape of this class of ship. The Arcadia, however, appears to be an entirely civilian transport ship and has no on board weaponry. The ship is characterized by a large bridge area that is topped by an array of sensory equipment including radar, radio antennae, and a a singular large exhaust stack for the engines. The back half of the ship is taken up entirely by a large landing platform, likely used for additional cargo space. Overhanging this topdeck space, are two large ship cranes likely used for loading and unloading cargo from the deck of this ship. The bow of the Arcadia, showing its unique double watertight doors. Below deck, the ship from bow to stern is taken up entirely by cargo hold space. The ship is unique in that it can take in a fleet of trucks from the stern and then offload the very same trucks through a pair of watertight doors at the bow of the ship. In 2018, the Arcadia is used to transport dinosaurs from Isla Nublar to docks near Lockwood Manor for auction. The ship is first seen by Owen Grady, Claire Dearing, and Franklin Webb, as they view it docked at the East Dock of Isla Nublar from a rocky outcrop overlooking the dock. Realizing they have no other choice but to sneak aboard the ship rather than be stuck on an island volcanically compromised, the four of them steal one of the trucks that the Arcadia crew had left behind, and barely make it onto the ship before it leaves the dock. As the ship sails from Isla Nublar, the Arcadia crew and the DPG activists watch together as a herd of Brachiosaurus reach the dock, and sorrowfully bellow as the pyroclastic clouds swallows the herd and then the island. The Arcadia is tugged into the harbor. 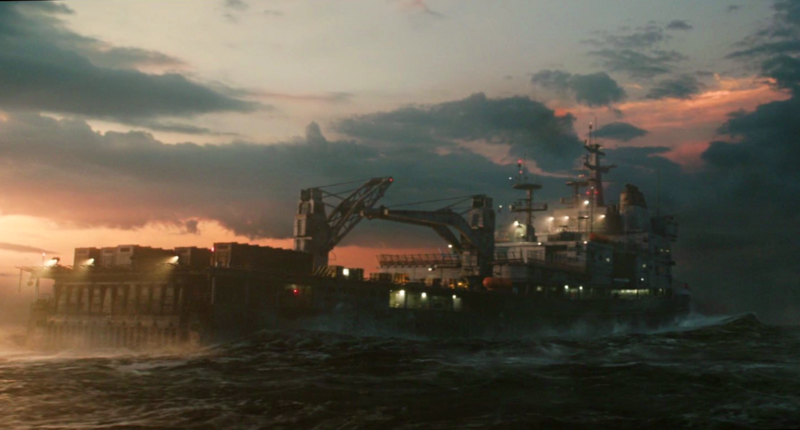 From Nublar, the ship heads north to California, and passes through a squall as it does so. 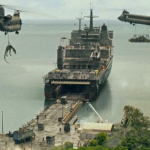 In the cargo hold, Grady, Dearing, and Webb find the truck transporting the Velociraptor Blue, who was injured by a gunshot wound while attacking one of Ken Wheatley’s mercenaries. There, they find paleoveterinarian and fellow DPG activist Zia Rodriguez, who Wheatley had ordered to keep Blue alive, working diligently with the injured animal. Rodriguez requires a blood transfusion from another theropod to keep Blue alive while she performs an impromptu surgery on the Raptor to remove the bullet in her thigh. 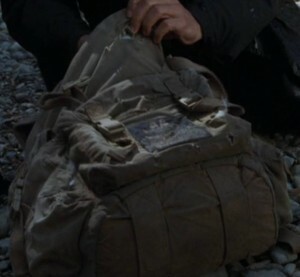 After taking blood from the Tyrannosaurus rex the Arcadia was transporting, Dearing and Grady manage to help Rodriguez with the transfusion and hold down Blue, as Rodriguez successfully removes the bullet from Blue’s leg. 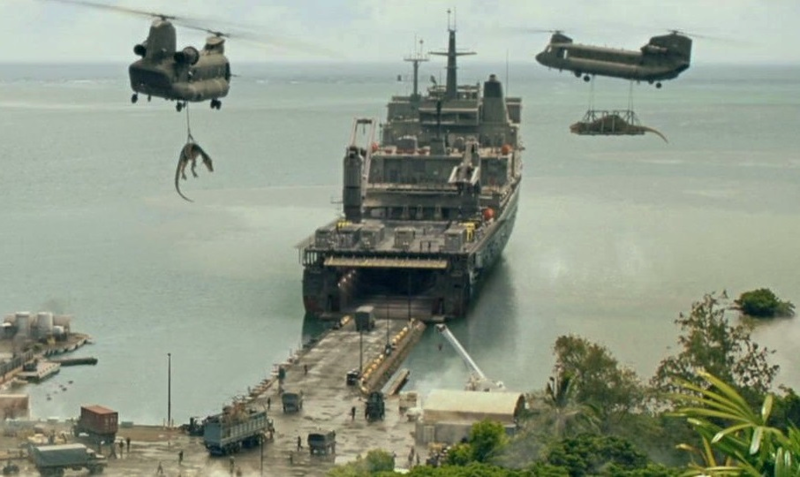 The Arcadia is last seen being tugged to Lockwood Manor’s coastal harbor, and then offloading the cargo of trucks and dinosaurs at the docks to be transported from the coast to the underground Lockwood Manor garage where many of the animals were sold at auction.